If the attitudes of high school students are a good predictor of eventual career choices, the future will continue to see computer science fields dominated by males. According to new research released by ACM and the WGBH Educational Foundation, compared with girls, more than twice as many boys see computer science as a "good" or "very good" choice as a college major. What's more, four times as many boys cited computer science as a "very good" career choice. The report (PDF) is part of a larger, multi-stage effort called New Image for Computing that looks to answer the question of why interest in computer science is waning in the United States and to promote computer science as a career choice. For the first phase of the effort, researchers surveyed 1,406 college-bound teens in December to determine the attitudes of high school students. What it found was that 52 percent of all student viewed computing, computer science, and information technology as good or very good potential choices for college majors. By this measure, the computing category is in the top 3, virtually neck and neck with business/management/marketing (55 percent positive) and art/music/design (53 percent positive). However, by gender, 74 percent of boys cited computing/computer science/information technology as a good or very good choice, compared with only 32 percent of girls. Broken down by ethnicity and gender, as seen in the following chart, white females had the lowest positive response to computer science as a major. Hispanic males had the highest. The story was similar when it came to students' views about computer science as a career choice. Fewer overall saw computing, computer science, and information technology as a good or very good career choice (46 percent overall). For boys, it was 67 percent; for girls, it was 26 percent. 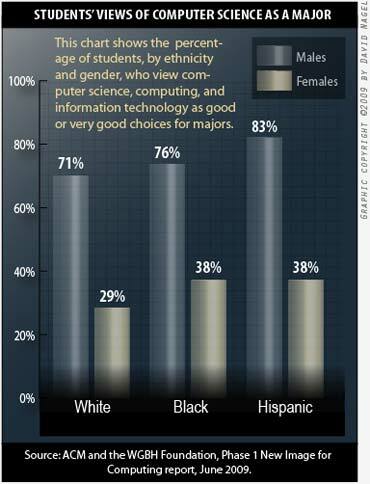 White girls, again, had the most negative view of computer science, while Hispanic males had the most positive. According to the report, the top positive drivers toward computer science were creating and discovering new things and working in a cutting-edge field. The negative drivers making a difference in people's lives and working in an "interconnected, social, and innovative way." In other words, people who ranked these last two as high priorities for their career choices ranked computer science low on their list. "We know that the number of computer science majors is not meeting projected workforce needs," said John White, ACM CEO and co-principal investigator for the project, in a statement released to coincide with the report. "Many factors contribute to the low interest in computer science, but the image of the field is a key element in current perceptions among this population." The report's authors said that, owing to the gender gap revealed in this initial study, more emphasis will be placed on girls as a "special focus audience" when it comes to creating messages designed to influence college-bound students to pursue computer science as a major and as a career. A complete copy of this first-phase New Image for Computing report, funded by the National Science Foundation, is available as a free download in PDF format. It can be accessed here.